Many newcomers are interested if they can make good money doing VoIP termination in Albania. The success of the business on terminating traffic in this country depends largely on the quality of the Internet. By the way, access to the World Wide Web is available all over the country. However, to do the termination, it is important to connect to a wired Internet, based on Dial-Up or ADSL technologies. Local fixed telephony (PSTN), as well as wired Internet, are characterized by a low level of development, in comparison with other European countries. By the quality of the wired Internet, Albania is on the 40th place in Europe, and on the 94th in the world (of 167 countries). The reason for this was the nineties when the government imposed restrictions on the installation and use of telephones. The other important factor is the relief features of the territory. Most of Albania is occupied by mountains, a lofty landscape, deep valleys, etc. Because of this, stretching the cable from one settlement to another is problematic. Proceeding from this, the wired Internet is localized mainly in large cities of the country, using modern ADSL technology. 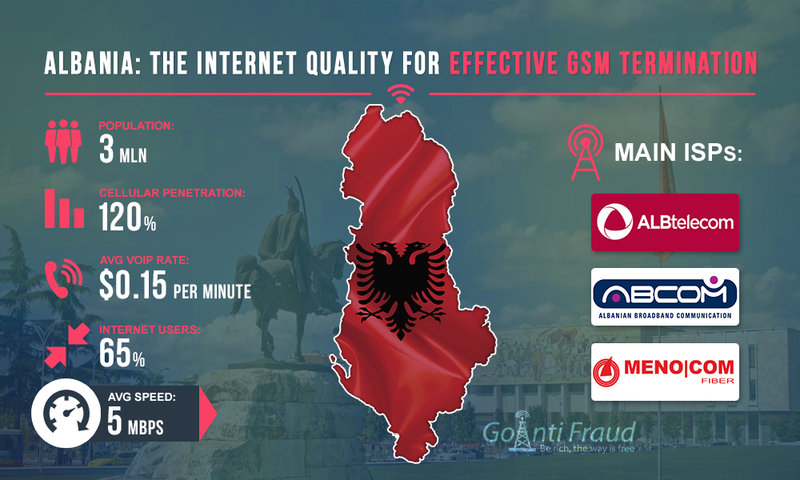 In addition, the average Internet speed in Albania is currently from 1 to 8 Mb/s, which is quite enough for the installation of multi-channel GoIP equipment. The use of new technologies has caused an increase in the number of Internet users in the last 5 years. To date, the total number of connections is about 2 million, with the Internet covering 60% of the territory of Albania. At the same time, the total population is about 3 million 040 thousand people. In other words, more than 65% of people are users of the World Wide Web. The Internet market is represented by about 12 providers. The largest of them are Albtelecom, ABC, Menocom, Tring, and Abissnet. Most of the above providers offer satellite and wireless Internet, as well as expensive ADSL packages. 1 MB of Internet costs about $14 on average. To do the termination, it is important to choose the optimal tariff plan that offers the best conditions for speed and pricing. The best option is a package of 10 MB from Menocom. It provides a high download speed of wired ADSL, at a fairly acceptable cost - $15.73 per month. The provider provides Internet connection services in Saranda, Konipol, Livagge, and Lukow.